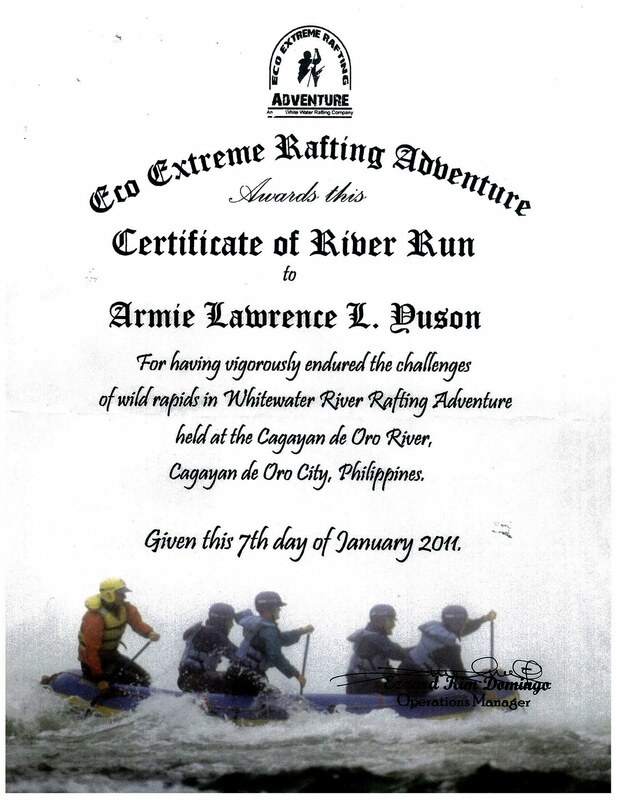 Where else could you experience the best White Water Rafting in the Philippines but in the original Cagayan De Oro River! 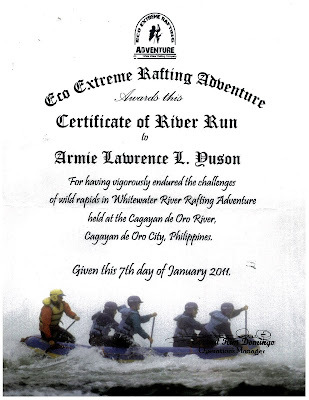 As soon as I arrived in CAGAYAN DE ORO airport and after checking Inn to Country Village Hotel, I immediately went to ECO-ADVENTURE to avail of their services and I chose the 700 Philippine pesos Package that will pass through 14 Major Rapids and will last up to 3 to 5 hours of White Water Rafting. How exhilarating is that?! As they were briefing me on what to do during rafting, I can’t help but get excited because I only get to watch these on television and now I’m already about to experience it. How cool is that?! So, as I was rafting and every time I pass through a Major Rapid, I can’t help but shout for extreme joy, the feeling is so much fun!!! I also tried swimming in this very long and cold river which serves as the boundary between Cagayan De Oro and Bukidnon. It was an unforgettable experience!!! Next time when I come back, I would avail of the advance services which will last for about 5 to 7 hours and will pass through more Dangerous Rapids. After the White Water Rafting Adventure, I rested in the Country Village Hotel for a while and after that I went to the Famous Cagayan De Oro’s Night Cafe held every Friday and Saturday night, it’s like a festival where they close the streets and place a lot of tents of food establishments, it’s a street party where numerous of foods, live bands and large crowds can be seen! After having my dinner, I visited this Bar in front of the Hotel named OASIS Resto and ate again, they have the tastiest “Lutong Bahay” in Cagayan De oro plus their band is very entertaining, making old songs seem like it has just been released and newly played on the Radios. I also ate at Butcher’s Best where they specialized in different varieties of Barbecue and I guarantee, it’s super delicious and you would come back to eat here again. When I got back to the Hotel, I just relaxed and swam alone in their swimming pool. It’s just a vacation where only one word could describe it, FUN FUN FUN!!! I would definitely come back and rediscover the extremeness of Cagayan De Oro, Misamis Oriental again. There are many places where you can go on a white water rafting trip but the best of these locations is at Cagayan de Oro City, in the Philippines. Great White Water Tours Corp, being the premier Cagayan de Oro water rafting adventure group in Cagayan de Oro City, can arrange for your white water rafting trip down the Cagayan River.